With his tongue hanging out, this Polar Bear found a source of water that he might want to have a drink from near the Hudson Bay coastline in Churchill, Manitoba. Winter has not yet taken over the tundra near the Hudson Bay coastline in Churchill, Manitoba and this polar bear decides he might want a drink from this small source of water he has found. Across the landscape, there are small pools of water that have become frozen and then melted again as the Hudson Bay region starts to prepare itself for the cold Arctic climates. 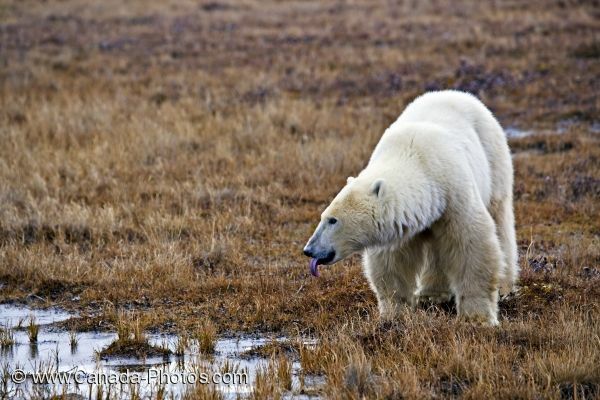 Picture of a Polar Bear approaching a small source of water on the dry tundra landscape near the Hudson Bay coastline.